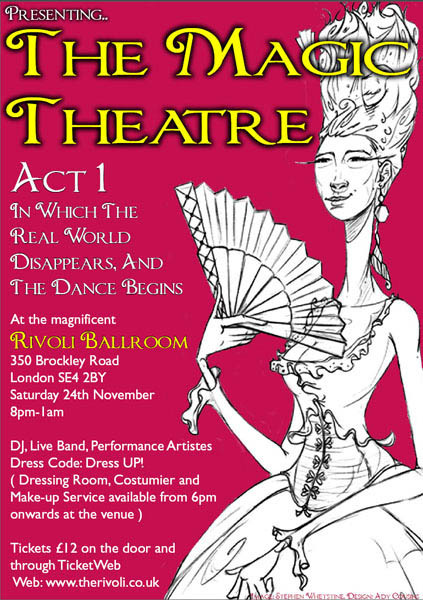 The Magic Theatre is a glamourous sounding new club night coming up at the gorgeous Rivoli Ballroom on Saturday 24th November. The idea behind the night is to hold to a diverse and magical event for "whoever you are or whoever you want to be". It is aimed at people of all sexualities and gender identities - anyone who loves to dress up and dance. Musically the night promises to cover 60s Soundtracks, Brazilian, Lounge, Library Grooves, Mambo, Cha Cha Cha, Sixties Soul, 60s French and Italian Pop, and Jazz Dance courtesy of DJ Weegee. There will also be live music from The Roadhouse 5 who play Rat Pack Jazz, Soul and select Pop. The Rivoli Ballroom should be the perfect venue for this unique night and was chosen especially as a fitting stage for costumes and outfits that are quirky, sensual and spectacular. In other words, a place to make a grand entrance, and to dance into the early hours. The Rivoli is one of very few remaining original ballrooms in London. It apparently started life as the Crofton Park Picture Palace in July 1913, before being converted into a ballroom with a large sprung maple dancefloor in the late 1950s. Its beautiful original decor includes red velvet, flock wallpaper, chandeliers and glitter balls. The club runs from 8pm til 1am though doors will open at 6pm for a Dressing Room, pre-club Costumier and Make-up Service with professional nail technician. Tickets are £12 and the promoters are highly recommending buying tickets in advance due to high interest and a strict capacity of 500.